One is a recent sponsor of Bibliothèques Sans Frontières, the other, creator of the Ideas Box, already four years old. This morning, June 8th, in the France Inter studios, the first receives the second. Excerpt. An idea for those today trapped by time, by space. An idea to spend time rightfully, but also to open space, to look ahead to the future, an idea that would allow for the breaking of borders, even symbolically, to create a link, to reconstruct. Imagine four boxes that one could assemble and disassemble in less than half an hour. All this makes up an autonomous media library, in energy and in network. A media library that can be transported, installed anywhere in the world, even in the most precarious areas. Tablets, computers, television, projector, games, films, digital and paper books. It’s just an idea, a library where there wouldn’t be any. It would be enough to install it in the street, in a school playground, in a refugee camp, wherever you like. There, we could inform ourselves, instruct ourselves, share, and open ourselves. The content would never be the same because it will have been curated for the place that will adopt it, following the language of its inhabitants, its culture but also its needs. It’s not one idea, but a box of ideas, flexible, available, always moving and changing. A box of ideas that’s called the Ideas Box, born four years ago, thanks to the organization Bibliothèques Sans Frontières, which can be found in around twenty countries and used by close to a million people today. Talk about an idea ! Augustin Trapenard : My guest today is never short on ideas. He participated in the creation of that which I’ve just described, but no doubt you’ve already had the occasion to get to know it in a different way, to sit down in one of its transparent chairs, to juice a citrus fruit with its three-legged juicer, or to walk around in one of its hotels, of its spaces, from Paris to Tokyo passing through Mexico or Metz. His multifaceted work has filled the entire world and has made him one of our most important creators. First of all, what does the Ideas Box, this mobile media library kit that you’ve created for Bibliothèques Sans Frontières, the organization for which I am a proud sponsor, embody for you ? 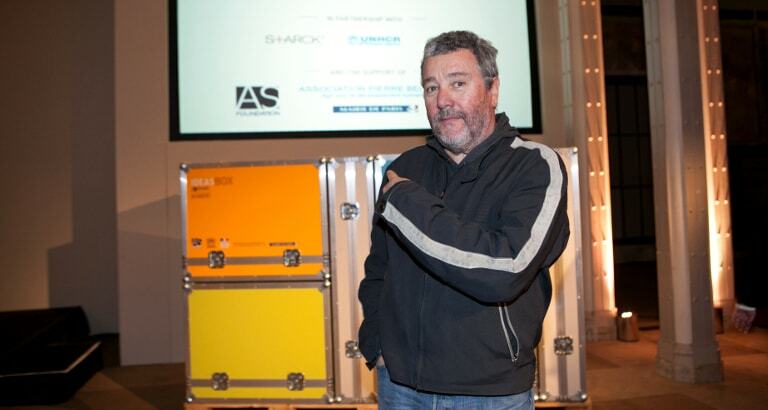 Philippe Starck : It’s a dream. I would love to be the people that made it, to be really useful, to save lives in one way or another. In the case of diverse catastrophes, people think of donating tents, care and food. But they asked: how do we rebuild ourselves? When your parents are hacked by a machete in front of you, when you no longer have a home, no longer have anything. These are books to reconstruct the imagination, reconstruct culture. They asked me to do this traveling village, this nomadic village, that functions extraordinarily well and immediately gives the image that each book is a brick helping to reconstruct people’s lives, a virtual home surrounding them! I have a deep admiration, a deep emotion for these people. We should all look for the idea in order to really help. A.T. : A dream, you say, the unalienable right to continue to dream. What makes you dream? P.S. : That! I dream of being useful, knowing that it’s a bit too late to become it. You and I, we’re useless, let’s recognize it, we’re totally secondary. The first thing is: did we create life? It’s sufficient to be a father, a mother. But are we capable of saving a life? No, I don’t know how to do it. When I say that, people tell me: you improve life. Yes, okay, but in order to improve life, it has to exist, and first it has to be saved. A.T. : How did you conceive of this Ideas Box; from which premises, concepts and materials? P.S. : These are things that we’ve dropped in muddy oceans, in deserts, in harsh environments. It was necessary to have the maximum intelligence and knowledge concentrated inside indestructible boxes. They unfold very quickly, and in the end, we forget that there’s an emergency because we’ve made them pretty and comfortable: vibrant colors, little chairs, little tables. When a kid sees them falling from the sky, he or she will naturally want to go there. Reconstruction and future happiness doesn’t have to start with a punishment. To find the entire show, click here !